Vembu BDR Suite backs up Microsoft Exchange Server running on VMware vSphere, Microsoft Hyper-V and Physical Environments. Also, it replicates the Microsoft Exchange Server from one host to another host for high availability. Vembu supports backup of clustered Exchange Server Storage Groups and Database Availability Group (DAG) environment. Vembu offers business continuity and high availability for Microsoft Exchange Server as part of Backup and Disaster Recovery solution. Vembu VMBackup offers agentless backup and disaster recovery solution for Microsoft Exchange servers deployed in virtual environments like VMware or Hyper-V and Vembu ImageBackup helps to backup the Microsoft Exchange Server deployed in physical environments. Vembu backs up the entire VM or physical machine including OS, applications and other files. So, if source Exchange server is unreachable due to system crash or major disaster, you can recover the VM or physical machine instantly using Quick VM Recovery feature on VMware or Hyper-V. Then, you can permanently recover the source VM to VMware or Hyper-V by using Full VM Recovery feature or to a new physical machine by using bare-metal recovery feature. IT admins might run into a situation, where any individual mailbox or email might get corrupted. 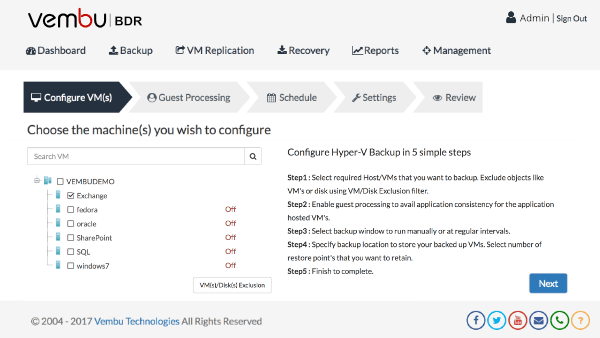 In this scenario, recovering entire VM or physical machine takes more time and resources. Also, this is not an ideal recovery option. 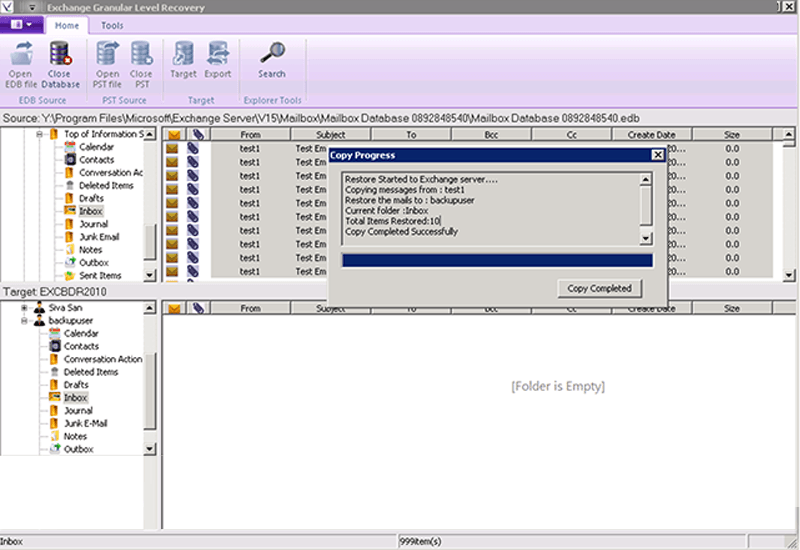 So, by using Vembu Explorer for Microsoft Exchange, you can explore the Exchange database file and instantly recover granular items. Vembu offers free explorer tool for Microsoft Exchange to restore the entire exchange database or individual mailboxes and emails instantly without restoring the entire Exchange Server.